For years universities have had cathedrals and chapels on campus for students, and the surrounding community, to come, enjoy, learn, and worship. Many of these cathedrals and chapels are breathtakingly beautiful and, hold a vast history within them. Like they say, “beauty is in the eye of the beholder,” so we just couldn’t pick our favorite or rank them based on which was most beautiful because they really all are spectacular. So instead of ranking, we have compiled a list of some of our favorite college cathedrals from notable universities across the country. Located at Duke University in Durham, North Carolina, Duke Chapel was completed in 1932 and formally dedicated on June 2, 1935. It is a neo-Gothic structure in English style, with large stone piers, pointed arches, ribbed vaults, and flying buttresses. The cathedral is made from Hillsborough bluestone, Indiana limestone, and Guastavino tile along with beautiful stained glass windows. Duke Chapel is unique for having three different pipe organs. Each organ is a different style that is used for worship and performance. One organ is located in the nave (Flentrop organ), another in the chancel (Aeolian organ), and the last in the Memorial Chapel (Brombaugh organ). The Duke Chapel is a Christian church that has a unique, interdenominational character and purpose. It strives to bridge faith and learning on campus, and in the community. Duke Chapel offers over 200 opportunities for worship each year. Every week there is Sunday morning service, Sunday choral evensong, Tuesday prayer and communion, Wednesday midweek prayer, and Thursday choral vespers. Located at Cornell University in Ithaca, New York, Sage Chapel was designed by a Cornell Professor of Architecture and opened in 1875. Many additions have been made in the following years making the chapel structurally sound, and expanding capacity. The interior of Sage Chapel has a rich and detailed history with representations of many Christian and education themes. Because of its breathtaking beauty, Sage Chapel has become a popular place for couples to get married. It is also home to the Cornell University Glee Club and Cornell University Chorus. Located at Yale University in New Haven, Connecticut, Battell Chapel was originally built as a Civil War memorial. It has been later enlarged and dedicated to undergraduate deacons who died in WWII. The chapel is designed in a High Victorian Gothic style of New Jersey brown sandstone and blue Ohio sandstone. Inside the chapel is an ornately decorated coffered ceiling, stained glass windows, solid oak wooden beams, and elegant gold leaf, blue, white, and red painting. Today, Battell Chapel is used for worship by the University Church in Yale. That includes Yale students, faculty, staff, and others from the New Haven area. It also is used for musical performances for choirs, wind ensembles, orchestras, and concert bands. Located at Princeton University in Princeton, New Jersey, Princeton University Chapel was completed in 1928. The chapel cost more than two million dollars to build. It was built after the previous college chapel had burned down in 1920. The Princeton University Chapel, a Tudor Gothic structure, is capable of seating two thousand people and was only second in size to the chapel at King’s College Chapel at Cambridge University when completed. Inside the chapel are iconographic stained glass windows, four “great windows,” stone masonry, and wood carvings. Princeton University Chapel is often used for weddings and memorials for alumni, faculty, and friends of Princeton University. The chapel is also used for concerts, denominational services, non-denominational ceremonies and an ecumenical service. Located at the United States Naval Academy in Annapolis, Maryland, the Naval Academy Chapel is known throughout the area as a point of pride, and a beacon to alumni, faculty, and staff of deeper faith. The Naval Academy is known for its beautiful and iconic dome that stands 200 feet above the main altar. Within the chapel are two stained glass windows–one of Sire Galahad holding his sheathed sword, portraying the ideals of naval service. The other is Christ pointing toward the flag. The Naval Academy Chapel is home to a 259 rank organ that is controlled by one of the largest draw-knob consoles in the world. Today, Protestant and Catholic services are held within the Navy Academy Chapel. Other important life events are celebrated within the chapel including weddings, baptisms, and memorials. Located at the University of Notre Dame in Notre Dame, Indiana, the Basilica of the Sacred Heart is a Neo-Gothic church that took over 17 years to complete. Within the basilica are 44 large stained glass windows and murals painted by Luigi Gregori, a Vatican artist. The Basilica of the Sacred Heart is known for being the tallest university chapel in America with a bell tower that is 218 feet high. The basilica is also home to the 5,164-pipe Wayne and Diana Murdy Family Organ. The Basilica of the Sacred Heart serves as the mother church of the Congregation of Holy Cross in the United States. It also welcomes many students, faculty, and visitors to come worship and learn within its walls. Located at Columbia University in New York City, New York, St. Paul’s Chapel is one of the first buildings in NYC to be designated as an official historic landmark. 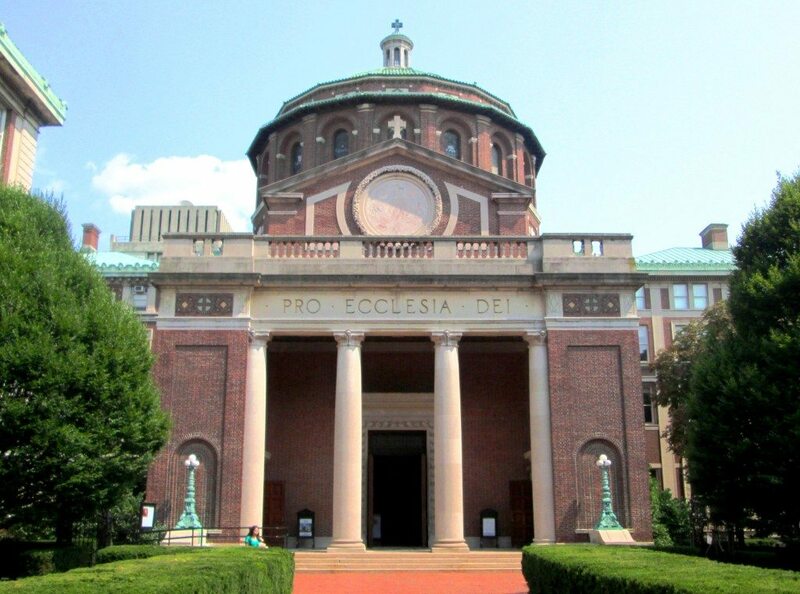 The chapel was designed in 1907 by I. N. Phelps Stokes, a former architecture student from Columbia University. Stokes designed the chapel in a dynamic adaptation of Northern Italian Renaissance architecture. The most prominent feature of St. Paul’s Chapel is the dome that is pierced by 16 arched windows and is 91 feet tall. Inside, the chapel is laid out in a Latin cross plan, stretching 120 feet from entrance to end. St. Paul’s Chapel is used for worship services, concerts, and university and private ceremonies each year. The chapel is also open daily for private meditation and prayer during the week. Located at Stanford University in Palo Alto, California, Stanford Memorial Church stands at the center of Stanford’s campus, and is known as the University’s crowning architectural jewel. Completed in 1903, Stanford Memorial Church was built as a memorial to Senator Leland Stanford who, with his wife Jane, founded Stanford University. Stanford Memorial Church features many beautiful and finely crafted mosaics and stained glass windows. The church is home to five different organs: Murray Harris organ, Fisk-Nanney organ, Katherine Potter-Brinegar organ, Continuo organ, and Tudor organ. The Stanfords believed the church should be open to all, regardless of denomination. They saw spiritual and moral values as essential to a young person’s education, and wanted the church to serve the broadest spiritual needs of the entire University community. Today, multi-faith services, denominational, and nondenominational Christian services are held within Stanford Memorial Church. Photo Courtesy of:C.B. Fisk Inc. Located at Harvard University in Cambridge, Massachusetts, Memorial Church was dedicated on Armistice Day in 1932 in memory of those who died in WWI. Since the dedication, memorials have been added for each war to commemorate Harvard students who have lost their lives in the service of the country. Memorial Church is an interdenominational Protestant church that serves as a place of spiritual refuge for the entire Cambridge community. In addition to worship services, Memorial Church also offers many programs for students and community members to come and participate in learning and growing. Located at the United States Military Academy in West Point, New York, West Point Cadet Chapel was dedicated in 1910. The chapel was built with Gothic style architecture. Similar to a medieval fortress, the chapel is built out of native granite and blends naturally into the surrounding landscape. Inside, the chapel is full of beautiful stained glass windows, many showing the motto of the Academy and memorials. West Point Cadet Chapel is known for having the largest church organ in the world, and is used frequently for services and concerts throughout the year. West Point Cadet Chapel holds Protestant services every Sunday for students and community members. The chapel also strives to provide religious support for West Point, to enhance community well-being and to facilitate the moral, spiritual, and ethical development of the Corps of Cadets as leaders of character. Located at Dartmouth College in Hanover, New Hampshire, Rollins Chapel serves as the University’s spiritual center. Dedicated in 1885, Rollins Chapel was designed in a Romanesque style with heavy round arches, built out of pink granite and red sandstone trimming. Inside the original structure, the chapel could seat about 600 people, and had a Greek cross formation. Since the first dedication, the chapel has undergone several renovations and expansions, it can now hold over 1,000 people. Today, Rollins Chapel is an interfaith chapel. There are regularly scheduled Ecumencial Christian and Hindu Puja service, as well as multi-faith Services and Jewish High Holiday services. Located at the University of San Francisco in San Francisco, California, Saint Ignatius Church is the fifth church to be build after previous structures were destroyed by fire and earthquakes. The current church was designed by architect Charles J. I. Devlin and took four years to build. Dedicated in 1914, the Saint Ignatius Church is known as a San Francisco landmark. The exterior of the church is often referred to as “Jesuit Baroque” as inspired by Italian Baroque, Spanish Baroque, Sir Christopher Wren, classical Greek design, and classical Roman principles. Inside the Saint Ignatius Church there are ornate, yet classic, decorations and iconography. There are beautiful works of art, coffered ceilings, multiple columns, and many stained glass windows. 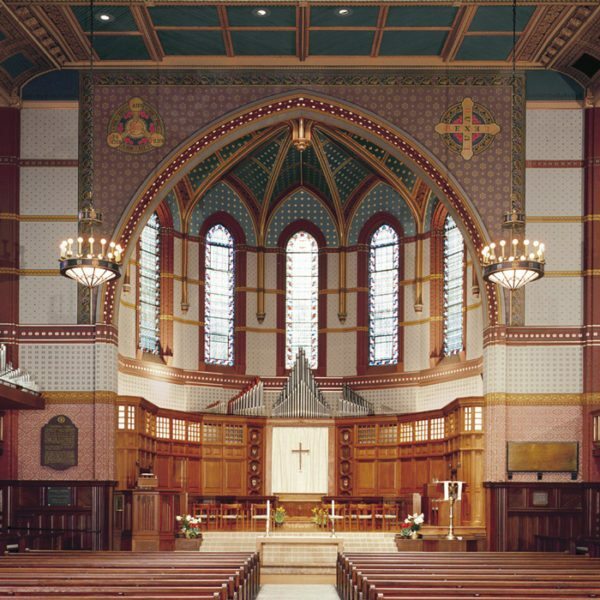 Saint Ignatius Church is a Jesuit parish and holds Catholic Mass, baptisms, weddings, Reconciliation services, funerals, and other interfaith events. The church strives to help build the community, provide outreach to those in need, and welcomes all to come, grow, and learn. Located at Northwestern University in Evanston, Illinois, the Alice Millar Chapel was dedicated in November of 1963 and was a gift to the University from Mr. and Mrs. Foster G. McGaw. The chapel is a contemporary Gothic style with a blend of traditional and modern styles. While the exterior is more Gothic in style, the interior features contemporary style in the undulating side walls, the Holy Table design, the chandeliers, pews, and stained glass window designs. Alice Millar Chapel is home to an interdenominational Christian community of Northwestern students, staff, faculty, and community residents. In addition to worship services, the chapel also hosts various University functions, concerts, lectures, and recitals. Located at the University of San Diego in San Diego, California, Immaculata Parish was dedicated in May of 1959. The parish is mostly Spanish in style with a mosaic dome and red Cordova tiled roof. Atop the dome stands a statue of Our Lady of the Immaculate Conception that is 10 feet 8 inches high and weighs approximately 8,500 pounds. The inside of the parish is ornately decorated with a solid bronze door, 20 side chapels, a barrel-vaulted ceiling that varies between 50 and 105 feet tall, marble pillars, and beautiful gold leaf details. Although the church was originally designed to just serve the University of San Diego, this is no longer the case. Today, the Immaculata Parish continues to serve the University as well as Alcala Park and the surrounding community. Located at Loyola University Chicago in Chicago, Illinois, Madonna della Strada Chapel was opened to the Loyola University community in 1939 and has been the University’s main chapel ever since. It was designed in the Art Deco style; this style can be seen in the inlaid marble floors, and various other designs within. The chapel also features 14 prominent stained glass windows; seven for the colleges that existed at Loyola when the Chapel was built, and seven for the principal ministries of the Jesuits. The beautiful chapel by the lake has been used for many years by students, faculty, and staff for Jesuit and Catholic worship, concerts, and performances. Located at Saint Louis University in St. Louis, Missouri, St. Francis Xavier College Church, referred to as College Church, was established in 1836. The church was the first English-speaking parish, and the second Catholic church to be opened for public services in St. Louis. Inside College Church there are many colorful stained glass windows that tell the story of Jesuit activity reaching out from Belgium in the old world, to a growing new world on the banks of the Mississippi River. The church has been a favorite place for many to visit in St. Louis and was listed as a City Landmark in 1976. Today St. Francis Xavier College Church is known for its outreach to the community, and providing a place for many to come worship and celebrate.